Why people say "God bless you" when someone sneeze? Sneezing is one of the common defense mechanisms of our body to get rid of foreign particles which enter our body while we inhale. As soon as such foreign bodies enters, in-order to prevent it from reaching the lungs, our brain sends signals to start sneezing. It is an automatic reflex action, once it starts, it continues until the irritating element is get rid of. It may also occur due to cold, allergy, inhaling of particles like smoke, dust other irritating substances etc. What happens when we sneeze? When some irritation happens in the inner line of nose, the nerve endings in those areas will send messages to brains to initiate action to remove that. As the part of reflex action, you will take a deep breath and hold that air in your lungs, which builds the air pressure in your lungs. Next is to release the air pressure and before that you close your eyes, your tongue presses against the roof of your mouth and suddenly your breath comes out with a great speed through your nose. The breath that comes out can travel at a speed of 100 miles per hour. This process continue till the irritating body is removed from your nose. Does the heart stops for a second while sneezing? There is a common saying that when you sneeze because when you sneeze,your heart stops for a mili-second. But in real your heart does not stop when you sneeze. Before sneezing the pressure in your chest builds and it may affect rhythm of your heartbeat and the your heart pulse may be delayed for one or two milliseconds. 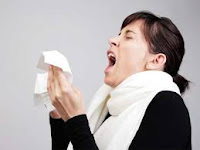 Don't try to suppress a sneeze, it may cause rupture of blood vessel in your head or neck and there are chances of death. It is also known that, If you sneeze too hard, you can fracture a rib. In old ages , people thought that a man's spirit is in the form of air which is trapped inside human body. So when some one sneezes, it may reduce his life span as a part of his spirit exits his body through the sneeze. This thought might have started the tradition of saying "God bless you" or simply "bless you" while some one sneeze.